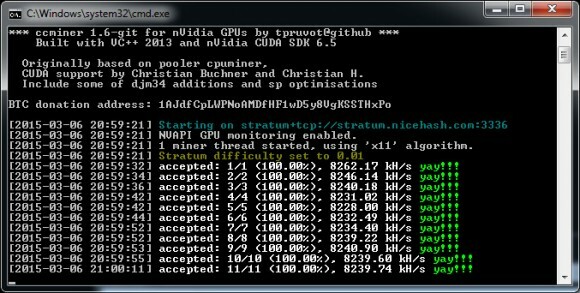 Recently we have been compiling and releasing windows binaries of the ccMiner fork by SP that is optimized for newer Nvidia GPUs based on the Maxwell architecture, but tpruvot has been active lately and we have decided to compile and release a windows binary from his latest source. The windows binary we have compiled for ccMiner 1.6-git by tpruvot (source) is with support for Compute 3.0 or later Nvidia-based video cards, unlike the SP releases that are Compute 5.0 and 5.2. This means that if you are using older video cards you should go for the tpruvot release as the SP fork will not function on these, newer Maxwell GPUs however will get much better performance with the SP fork. Below you can find a quick comparison we did with the latest ccMiner 1.5-41 fork from SP and ccMiner 1.6-git fork by tpruvot using a GeForce GTX 980 GPU running at stock frequencies. tpruvot and sp-hash released ccminer versions with whirlpoolx too.